Just over a year ago, the scene lost one of it's most respected people - ZeeVee from SqratchAttack. As a testament to the loss and the level of respect felt by those around him, DJ Happee has devoted a track to ZeeVee on his upcoming "The Renaissance" LP. If you feel that you'd like to say a few words about ZeeVee, you can leave a message on the Zone Seven office line - 858 366 4600, or alternatively you can record an MP3 and email it to happee_at_djhappee_dot_com. Our thoughts are with ZeeVee's family at this time of year. In what can only be described as selfless devotion and dedication to his new product, one guy called Moe has frankly been bugging the hell out of everyone with his amazing energy in promoting Promats slipmats just about anywhere he can. So having had a pair for a while, I figured it was only right to scribble a few words about yet another slipmat. And I'm glad I did as they're rather nice. Times are a' changin' quicker than many of us can deal with. T'was but a few years ago when I used to pop off to to my local record boutique and pick up whatever was in stock, often without a clue what I'd bought aside from the artist having a Hiphoppy sounding name. These days, every new release is but a click away and jumping on the digital download gravy train bandwagon, Serato bring you whitelabel.net - a way for all you SSL users to get hot new releases first, using SSL as a dongle no less. 2 golden rules of computing - never use v1.0 of anything and never use a beta if you're doing something important. Well v1.0 of SSL is ancient history now, but the next big upgrade of SSL is upon us as a public beta. But be warned - use it at your own risk. The New Zealand boys will laugh in the face of fat cat lawyers toting frivolous lawsuits. One of the beauties of all this digital stuff is it's portability. Grab your laptop, SSL box or 57 and off you go. 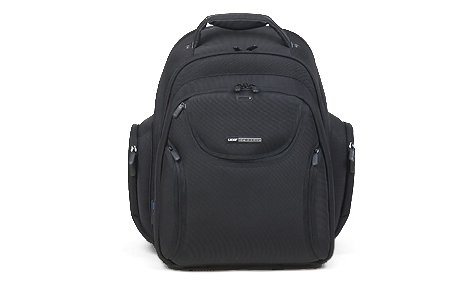 But it's just not the done thing to turn up with Tesco bags or your gran's shopping trolley bag so to stop crsuhing embarrassment and complete loss of street cred, Rane, Serato and UDG have teamed up to make The Creator Backpack. Serato have been a busy bunch as the next 4 news story will attest. Story number 1 - despite being pretty safe and sound under the hood, SSL has a glitch here and there that are easily and regularly fixed with maintenance updates, the latest of which is v1.6.3. I love the digital age. If something doesn't work right first time, you just shout at some programmers and after they've stopped crying (assuming you shouted hard enough), they tap their keyboard repeatedly and out the other end comes a new version. Such is the case with M-Audio and Torq. Not that Torq was running like a bag of spanners, but everything can work just that little bit better. Out of the M-Audio programming factory comes v1.02. You can always trust the Soul Brother Number 1 to make not only a momentous entry, but also an equally memorable exit. This morning - Christmas Day - the Godfather of Soul, the amazing Mr Please Please Himself James Brown passed away. It's all over the various news channels so I'll leave you to get all the details. Don't be sad - Mr Brown came, he saw and he funked like no other. Instead of mourning, push aside the pile of discarded wrapping paper, fight your way to the decks and put on your fave James Brown tracks and get the whole house up on the good foot. That's what he would have wanted. ...another Christmas greeting from - but we mean it every year. And this is the 4th one I've posted - not bad for tiny little niche DJ site innit! This has been a pretty bloody momentous year for yours truly and next year looks to be much the same as well - something that I'll cover in my end of year retrospective and message to the DJ nation. But in the meantime, get off the internet, get down the shops and buy those last minute gifts for friends and family and have a great Christmas and a Happy New Year as well! Behringer isn't a name you might expect to see on the pages of but when they approached me with couple of units to review, I just thought it would be plain rude to refuse. One is the Tweakalizer - an ultra affordable effects unit - that I'll be inserting into my FX loop over the Christmas break - and the other is the BCD2000 midi Interface. Deft took delivery of this a while ago and the results of his usual extensive testing can be found right here. Like it or loathe it - the laptop is becoming a standard lump of gear for DJs. Great - yet more gear to lug around and find a place for in our tiny little spare rooms or to stand safely on what are nothing more than creaky old tables at gigs. So you need something to make sure that your expensive investment stays safe and sound while you do your DJ thing. I got sent a Litlab Uberstand as part of the Rane Fest so I figured I'd put it through the review machine as see how it faired. And it faired very well indeed - IMHO one of the few wow products. Not just me however, NdB said the very same thing after seeing it as well. A little while back, the relationship between long time buddies Native Instruments and Stanton officially came to an end, which of course led to a whole heap of people dancing on the still warm grave of the allegedly dead Final Scratch product. But just hold on to your horses people - I can officially, exclusively albeit somewhat scantly announce (well more like tease) the future of Final Scratch. You read it here first - again. Another brief but important world exclusive for ! My name is Mark and I'm a bagaholic. I have no space for them, don't have much to put in them but I love them. And my bag needs evolve all the time. Now I'm based at home, I only have need for a laptop bag from time to time, but when I travel, I seem to struggle with an immensely crap wobbletastic trolley plus a second cavernous bag that is a poor partner for the trolley. So when Magma told me about their new multi-purpose trolley/bag combo, it's as if it had been made especially for me and my increasing jetsetter needs. But it's made for you guys and your various needs or whatever you wish to use it for to be honest - versatility is the key. It's all well and good writing reviews and telling people in geeky detail just how great a product is, but a picture paints a thousand words - and moving pictures replace the words completely. So check this movie out - UK DMC Champ DJ Muzzell has recently been sponsored by Vestax and Leisuretec and as a thank you, has but together a quality movie that shows off some of the new features of Vestax's flagship scratch mixer - the PMC-08Pro as well as displaying exactly why he's one of the world's best tablists. And while I'm on about it, Muzzell also has new breaks wax made alongside Awekid called Donkey Work - hitting the streets right now. In my scratchernet journey, I've had a tendency to buy domain names like buying DVDs. If I saw a name I liked, I just bought it without to much of a plan as to what I would do with it. But now it's time for an early spring clean ch�z skratchworx so I'm getting rid of some DJ friendly domains, in particular some rather tasty skratchy ones. Audio Innovate arrived on the scene last year with a mixer - the AEM-100 - that dared to challenge the established conventions of the scratch mixer scene. Analog knob twiddling synth style effects, left-of-centre thinking Fader Cuts buttons and dropping in as standard the almighty Pro X Fade made this a special mixer. It was greeted with a plethora of emotion - some derided the AEM-100 for its cheaty toy fader cut buttons, while other instantly orgasmed at the old school effects. Elliot Marx - being the owner of AI - listened to feedback and tweaked as much as he could without running into expensive retooling costs. The result is the AEM-100i. It's the future - I'm telling you. Kidz wil b rockin dis on da tube fo shizzle... OK so it's not going to revolutionise the digital DJ market just yet so Serato can sleep easy at night but still, it's worth posting about just so we can see how far the influence of the DJ reaches into the digital realm. 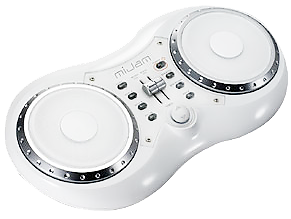 Presenting the mi Jam Mixer - the brand new iPod wonder toy aimed at putting us all out of work and killing the DJ forever. Or so you'd think from some of the rants I read around the scratchernet. Big up James for the heads up! It's just come to my attention that people have been struggling to enter the competition. This has been due to a limitation of my hosts built-in form management. All entries have been saved and backed up and the database emptied again. So if you've tried to enter after 1st December, enter again - only once though - to be sure of a chance to win the assorted booty! Sorry for any inconvenience caused. 24 days left to enter! So Christmas is coming and what better gift for a DJ than a lump of DJ gear. So with this in mind, I've taken on Dolphin Music in the UK on a test affiliate scheme. If you click and buy something from them from the banner on the right, gets a small commission. And remember, if anyone you know needs an iPod for a loved one from Santa this year, get them to click and buy on the Apple banner on the right. That is all. Traktor 3.2 - Hello Macbooks! Our new friends at Native Instruments (hi guys! :D) are going through the painful process of extracting Final Scratch from within the guts of Traktor. And part of this process has allowed them to bring the package up to date to get it working with Intel Macs. Yay! Obviously, it's not only that - there all sorts of other stuff going on as well, all of which is detailed in the main story. And it's a case of bad news and then good news for Final Scratch owners as well. 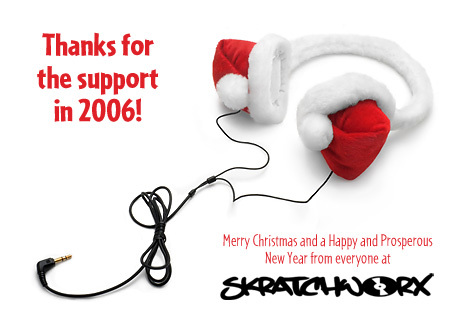 So it seems that skratchon 2006 isn't happening as we expected it would - which is especially annoying for many people including me as I was going to cover it in person for the skratchworx massive. 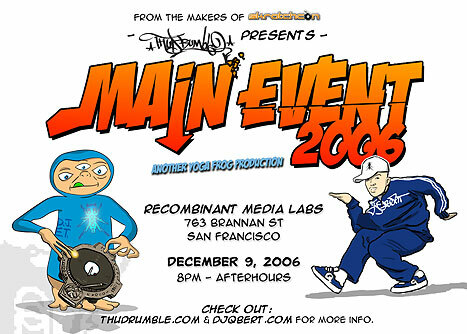 But instead, "The Main Event" is happening along with "Spin the Battle" - an unusual twist on the scratch battle format. And the final of the Pepsi QQuest battle is happening as well. And just for good measure, a big dollop of skratch talent is being thrown in for good measure to make this a worthy replacement for disappointed skratchcon hopefuls. But it all happens next Friday 9th December in San Francisco so you'd better make some arrangements pretty damned quick if you want to be there.